Walking past the expansive yellow-paneled home in the Old Irving Park neighborhood, you might notice the prominent wraparound porch and decorative flourishes in blue. But there are other features of the 160-year-old home that are harder to spot – perhaps by design. 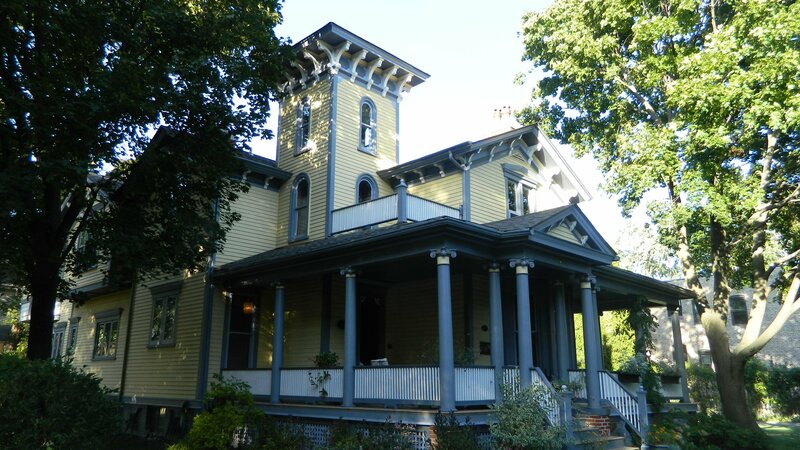 Rumor has it that this grand Italianate home was once a stop on the Underground Railroad. David and Kris Cloud, who bought the farmhouse about two years ago, noticed parts of the home that supported the theory, which has been circulating for decades. The well is about 50 yards from the home, according to Cloud, who describes the house as having a feel he can’t quite put into words. In 2018, speculation could turn to fact. Archaeologist Rebecca Graff, a professor at Lake Forest College, plans to survey an area of the house in July with the help of her students. They’re exploring whether an area beneath a stairway that’s covered in bricks and debris could have served as an entryway to a tunnel. The survey will take just a few days, but the excavation is more complicated. That four-week process will not happen until 2018 – and it’s expensive. A portion of an $800,000 "Digital Chicago" grant from the Andrew W. Mellon Foundation that was given to Lake Forest College will cover the costs. Graff decided to explore the house after getting a tip from Keith Bringe, former president of the Chicago chapter of the Society of Architectural Historians, who had discussed with the Clouds ways to explore the home’s history. The house is also being considered for the National Register of Historic Places. In the meantime, Cloud plans to do some detective work of his own. He’s been in communication with two businesses that lease out special radars that can capture images of objects buried underground or otherwise invisible to the naked eye. It might provide clues as to what lies beyond the surface of his home, including the front yard, which he will explore for old items like broken china and crockery. Whether or not Graff’s excavations next year find evidence of underground tunnels, she’s optimistic the work will turn up important artifacts. “Historical archaeology is especially important because we get stories that we don’t get otherwise through historical records,” Graff said. April 20: For nearly a decade, the website Forgotten Chicago has documented the city’s storied past. Meet the site’s co-founder and editor, Jacob Kaplan. Feb. 1: One hundred years ago he took unforgettable photos of Chicago in turbulent times. Exploring the life of Jun Fujita, a Japanese immigrant who captured city history. Feb. 5, 2014: Was a Chicago housing project once a stop on the Underground Railroad? Geoffrey Baer discovers a hidden piece of African American history in this week's edition of Ask Geoffrey.